There's nothing worse than coming home to a home filled with trash. Unfortunately, this situation is far too common among dog owners. Canines are simple creatures. They're drawn to interesting smells and will often go to great lengths to roll around in it. Kitchen and bathroom trash cans are go-to investigations spots for any curious dog looking to get into some trouble. So how do you keep your dog out? Dog-proof trash cans are a must-have item in your home. They're specifically designed to keep pups out. Depending on the particular design of the trash can, it may add multiple layers of security and prevent odors from even attracting your furry friend's attention in the first place. There are plenty of great products on the market to meet your needs. Here is a selection of some of the best. This company is known for making innovative products that make life easier. This dog-proof trash can is no different. The trash can is made out of thick, durable plastic. It takes on a semi-circle design for easy placement in your kitchen or bathroom. The hinged lid works with a stainless steel foot pedal. To gain access to the 13-gallon pail, just step on the pedal. When you take your foot off, the lid comes down gently to reduce noise. There's an included sliding lock to keep your pooch out at all times. This beautifully designed trash can from iTouchless is great for keeping canines out. It's a 13-gallon trash can that measures approximately 25 and a half inches tall. On the top of the trash can is a motion sensor. It's pointed upwards and detects when you're about to throw something away. The lid will open up automatically. Indicator lights on the lid show you when it's about to close. 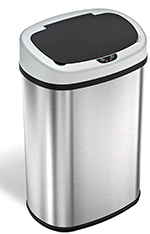 The entire trash can is clad is fingerprint-resistant stainless steel. It also features a built-in odor filter. It can neutralize smells before they attract your dog. 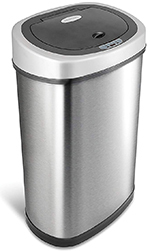 This trash can from simplehuman has a relatively minimalist design. However, it has a unique opening mechanism. The trash can is built for smaller spaces. Rather than a traditional rectangle or semi-circle shape, this design combines the two into a unique slim profile. A foot pedal on one end is used to open up the butterfly lid on top. The two sides of the lid flip away from each other to provide access. The trash can is made out of stainless steel and can hold up to 11.9 gallons. If you're looking for a high-tech trash can that can keep your puppy out, check out this option from Ninestars. It's an electric trash can that features a built-in motion sensor. The sensor is located on the top of the trash can. It's smart enough to know the difference between your hand and a curious pet. Your dog may not even be aware that there is trash inside thanks to its tight lid. The outside of the can is covered in stainless steel. It also has a non-skid base on the bottom. 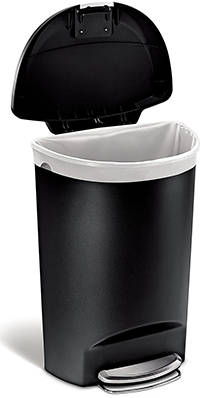 Another great option from simplehuman is the 10.6-gallon TouchBar kitchen trash can. It has a unique opening device. A large bar on the lid of the can be touched to provide access. You can easily open it up with your hand, elbow, or hip. What makes this trash can so great for dog owners is its size. The can measures 28 inches tall, making it inaccessible for most dogs. It also weighs over 14 pounds. The lid on top is tight enough to keep odors inside. 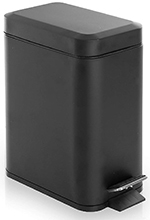 With a capacity of only 5 liters (1.3 gallons), this trash can from Bino is great for bathrooms. While most bathroom garbage pails are very simple in design, this product has all the security features of a high-quality kitchen model. It has a convenient foot pedal for hands-free operation, a removable inner liner, and a strong lid with a tight seal. 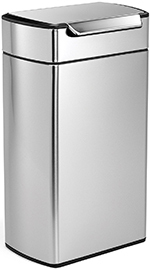 The entire outer shell of the trash can is made of stainless steel to provide you with a clean look. On the hunt for a matching pair of kitchen and bathroom dog-proof trash cans? Take a look at this product set from Ninestars. The larger kitchen trash can has a capacity of 13 gallons while the small bathroom model can hold 3 gallons. Both utilize smart motion sensors. When the lids are closed, they're tight enough to prevent odors from drifting. 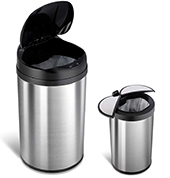 The two trash cans have a stainless steel finish that's sleek, easy to clean, and fingerprint resistant. Both cans also have a non-skid bottom to prevent tipping. Do You Really Need a Dog-Proof Trash Can? You should never underestimate your dog. Even the most well-behaved pup is capable of making a huge mess. It's not uncommon for new dog owners to think that they don't need a dog-proof can. However, just because your pup hasn't explored your garbage can yet doesn't mean that they never will. Most dogs won't get into the garbage when their owners are around. They're preoccupied doing other things and always have you to go to when they're bored. It's when dogs are left to their own devices that they tend to get into the trash. You should always assume that your dog will get into trouble if they have the means to do so. Here are some reasons why you should invest in a dog-proof can, even if you don't think you need to. If you have never seen what a dog can do when they get into the trash, you're in for a big surprise. 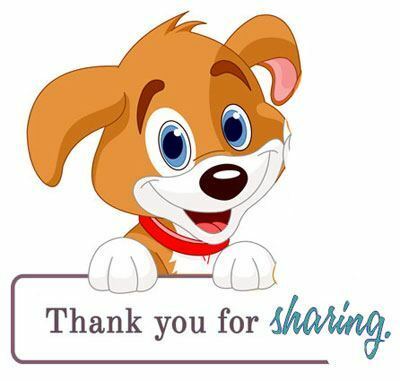 Dogs don't just dig into the can, they spread out its contents throughout the entire house! Dogs can easily rip through garbage bags and run into every room, spilling the bag's contents along the way. Most pups also explore vigorously. They will thrash around in the garbage, sending bits of food flying to the walls! Cleaning up that kind of mess is not an easy task. It can take several hours. If the trash can was filled with food, you may also be facing the costs of removing odors and stains from your furniture. Needless to say, it's a lot easier to just avoid the problem altogether. Dog-proof trash cans will keep the mess contained. These products will make it difficult for your dog to get in. You can leave your dog at home with peace of mind. In addition to the mess you find around your home, you're also going to have to deal with whatever gets on your pooch. Despite their adorable appearances and fun demeanors, dogs are filthy animals. They love to roll around in dirt and garbage. Once they get into your trash can, they'll spread out the mess and get as much smells into their fur as possible. Unfortunately, you're going to have to deal with this unhygienic act once you get home. With a high-quality dog-proof trash can, you can keep your pup smelling fresh. One of the biggest reasons why you should get a dog-proof trash can is the safety they provide. Sure, dealing with the hygienic issues and messes are annoying, but the possible health issues like Garbage Toxicosis that could come up are even worse. There are a lot of things that dogs cannot eat. Many of those things are foods that we humans consume on a regular basis. If your pup eats something they find in your trash can, they're at risk for potentially fatal reactions. Some common foods your pup should never eat include sugar-free candies, chocolate, onions, and much more. Additionally, dogs can eat things that pose an immediate threat. For example, dogs can experience injuries eating chicken bones. They could also eat small garbage items that lead to choking injuries. If you're not there during their trash can adventures, your pup will not be able to get the help that they need. There are just too many dangers to take the risk. You can rest easy knowing that your dog is safe with a dog-proof trash can. Why Do Dogs Dig in the Trash? Understanding your dog's behavioral habits is important. You need to know why your dog loves to get into the trash so that you can put a stop to it. This knowledge can also help you find the right trash to fit your dog's particular habits. Hunger is a big motivator. While most dogs are always down to snack on anything they find, extreme hunger causes dogs to search for food on their own. This is something that tends to affect dogs who are by themselves for long periods of time. After several hours alone, your pup's hunger levels will rise. If you're not there for them to beg to, they have to take matters into their own hands. Your trash cans are a source of many powerful odors, so it's often the first place they go. Smells from last night's dinner or this morning's snack are always wafting from the bin, tempting your dog to explore. Sometimes, your dog will get into trouble just because they're bored. Again, this is an issue that plagues dogs with working owners. Canines need to stay entertained throughout the day. While outside pups can run around and chase squirrels to pass the time, indoor dogs aren't that lucky. Bored dogs are destructive dogs. If your pup doesn't have adequate entertainment throughout the day, they'll get into trouble trying to find it for themselves. This leads to some messy adventures in the garbage bin. Your dog can experience emotions in the same way that you do. While you can easily process those emotions and take action to resolve them, dogs can't. They don't really have the power to control their surroundings or feelings. Many dogs experience feelings of stress and anxiety when their owner is away. If you have a young puppy that's not familiar with your home just yet, those feelings are exacerbated even further. Bad behavior is how dogs deal with their emotions. They seek out ways to find comfort when you're not there. Unfortunately, the tastes and smells of a trash can are often the first stop for a lonely dog. So what exactly makes a trash can dog-proof? Trash cans come in all shapes and sizes. They also have great features that can make them virtually impenetrable by dogs and children. Here are some things to look out for. The size and weight of a trash can is an important thing to consider when you're shopping. You want a trash can with dimensions that work for your needs while also preventing your dog from getting in. Typically, the size of a large trash can is enough to deter smaller lap dogs. However, if you have a large dog, you may have to look beyond size. That's where the weight comes in. One of the most common trash-digging tactics for dogs of any size is to tip the entire unit over. Once the trash can is on its size, your pup will have no problem getting into the garbage. Heavier trash cans are great for preventing this issue. The added bulk will keep the can upright. If you have a particularly rambunctious dog, you may need to get a trash can that's made of tougher materials. Cheap plastic garbage pails are no match for the teeth and powerful jaws of a large dog. It may take some time, but eventually, your pup will get through. Steel garbage cans are great for keeping canines out. Not only is the material tough, but it's also significantly heavier than plastic alternatives. A great dog-proof trash can will have a tight and secure lid. The lid should be able to create a good seal around the rim of the pail. While it doesn't have to be completely airtight, something close is recommended. In addition to keeping the contents of the trash can secure, it can also limit smells. Remember, the smells that are coming out of the trash can are some of the biggest attractants for dogs. With a tight, odor-sealing lid, your pup won't even realize there's food in there. In addition to having a tight lid, many dog-proof trash cans come with locks. Locks add a second layer of security against more creative canines. As we mentioned earlier, many dogs like to tip the garbage can over to gain access to the trash inside. Even tight lids can be pried over once the can is on its side. Locks ensure that your dog can't get in, no matter what. Locks often slide into place with a simple flick of the finger. They can be locked and unlocked to meet your needs. When you're at home cooking, leave the can unlocked so that you don't have to fiddle with it each time you need to throw away. When you need to leave your pup alone for the day, simply flip the lock down for extra security. Finally, it's important to consider what type of opening mechanism a trash can has. Simpler products have a basic hinged lid. Others utilize more advanced technology. One of the best options is to get a trash can with a foot pedal. The foot pedal provides hands-free access to the garbage can. More importantly, it makes it nearly impossible for your dog to operate. Most dogs don't have the strength, weight, and know-how to operate the foot pedal efficiently. As a result, your trash stays safe. While your pup may not show signs of curiosity with your standard trash can, it has probably caught their attention at some point. All it takes is some boredom and a couple hours alone for them to make their move. 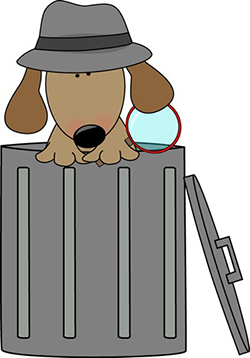 You can prevent messes and accidental poisoning by investing in a great dog-proof trash can. These trash cans keep your dog out and provide you with peace of mind.